Jeff Ridgeway and I attended one day of the three day 2011 SoMIRAC (State of Maryland International Reading Association Council) Conference on March 30. This is probably the best conference of any that I attend. Remember that the school systems have Reading Teachers as well as all of the other staffs who would be interested and participate in it - so it is a large conference. We attended sessions that include "You Mean a Real Person Wrote That?'' Itwas about bringing authors to your workplace. The Keynote Speaker, Dr. Danny Brassell, talked bout "Waking Up Your Lazy Readers." He was excellent and the info would apply to public libraries as well as to schools. We also heard the Featured Author, Jay Asher, talk about his fiction book "Thirteen Reasons Why." (good for about 12 - 18 year olds.) He has other books in process. The Featured Speaker for afternoon was Sneed Collard, 111. Every one of his books is fantastic in text and pictures. He was great and we left on a "high." Other time was spent at the many vender booths and interaction with persons we know. The Swan Meadow School in Garrett County was able to get him for a visit to their (Amish/Mennonite) school. I notified the public libraries early on about taking some of their groups to hear him. I attended this webinar because I thought I could create some quick tutorials on how to use Whilbr. It is a quirky program and we've created lots of work arounds. I think it needs a how to search tutorial, how to use zoomify etc. The program suggested a number of software solutions from relatively cheap - Snagit - to wondrous - Captivate. I realized that since I would be creating small tutorials, the question of hosting doesn't apply, but for a e-Learning package like Captivate then that question would need to be considered. What was also discussed was sticking with software families - a screen capture software program written by the same company as your video producer. 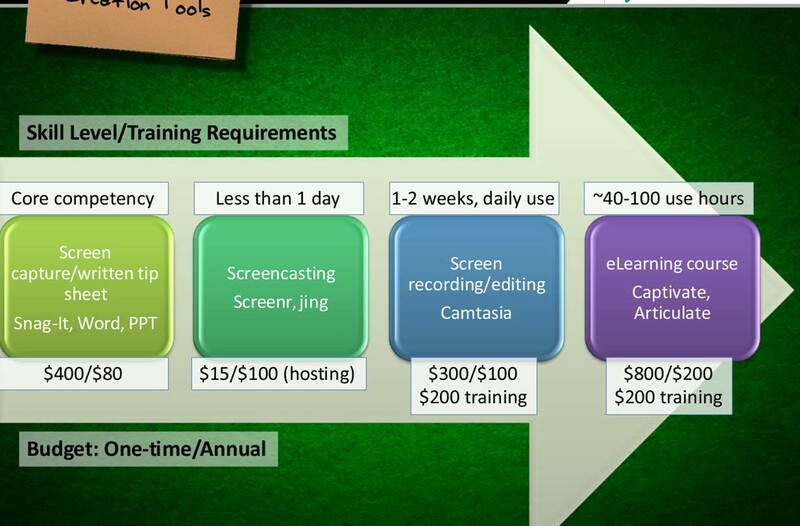 And I know I should look at San Francisco Public Library's process for creating their tutorials. Unrelated, somewhat. I now understand why Julie has a small white board by her desk. Who needs Captivate when you have a white board, some artistic talent and a camera? Program Description: When the Kansas library community participated in a statewide 23 Things program in 2010, it opened up a new way to look at learning virtually, especially for encouraging librarians to continue their learning after the structured program's end. through their Passport to Learning, Braum and Hickey show how to enrich the virtual learning experience. Burns looks at how 23 Things has evolved, its strenghts, its challenges and the "what's next." Program description: Hear the experiences of a public library using Second Life and an academic library using Facebook to manage courses and engage learners. Paterek discusses how a public library uses different locations and avatars in 3D simulation to facilitate learning and provides examples of virtual classrooms using PowerPoint presentations, live simulations, chat, computer voice applications, and virtual reality. Czech went to the students at Wayne State University with a Facebook group to manage a Productive Tools course.